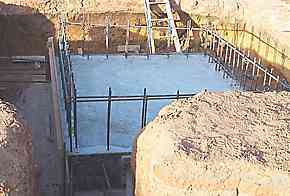 In-Ground Shuttering - As easy as it gets, just using the sides of the excavation for the formwork. Concrete shuttering or formwork at it's very simplest. The concrete is poured straight into the excavation. Here you see a foundation for a concrete reinforced blockwork wall. A completed wall is seen to the right. It is simply a matter of working out if it is worth the bother to put in some sort of throw away forms like scraps of cement sheets into the parts that have been over excavated. I have done it often enough in the past, but I doubt if the cost of concrete saved was worth the effort. The guys that did this footing didn't think so. In-Ground Shuttering - An actual drawing of what is being constructed here, it is a strip footing for 200 series concrete blockwork. In-Ground Shuttering - Sketch showing how to for a step in a strip footing. The reason for strip footings like this, rather than a raft slab in residential construction, is mainly if the site is sloping. The other reason of course is if you want the ground floor slab say a metre higher than ground level. If you have a sloping ground where you are putting strip footings for masonry walls, it is easy enough to form a step, to keep each section level. The step is a multiple of the block or brick heights. Note that there is ALWAYS an overlap where the reinforcing steel and the concrete thickness are lapped at each step. 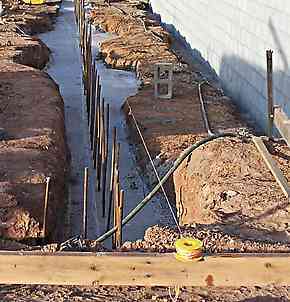 So why not just run the footing rebar along the bottom of a sloping trench, and then add the step on top. Work it out, which is cheaper, few lengths of rebar or all that extra concrete. In-Ground Shuttering - Blinding slab under the design slab. In the case here, a slab for a lift well, the builder has poured what we call a blinding slab which is a thin (50mm) layer of concrete, first. This to make it easier to set up the shuttering and keep his reo steel nice and clean. They have formed the slab up rather than pour like the previous trench photo, because they have a lot more reo steel (rebar) to get in an accurate position. Also they will use the edge of the slab to push to when they start bringing up the walls. Always leave plenty of room around the outside, if you are shuttering up something like this. It makes it a lot easier to work and to strip. The temptation is to not dig too much out, but it is false economy, you need enough room to work. I like to see a piece of timber as the bearing surface of any brace, strut or prop, to spread the load. In the sketch at the right I have shown one against the side of the excavation. Otherwise the pressure of the wet concrete could force the bottom brace easily into soft ground. Even if the ground is hard or even rock, I still put one there. The nails from the brace hold it in position when vibration is applied to the concrete. I used to use a metal pan system, Acrow "Uform" for walls and deep edge shuttering, that was clipped together with keys and wedges etc. A couple of times we had earth or concrete fall down into a close gap between the excavation and the formwork, and it was almost impossible to strip the formwork. So, give yourself that extra bit of room, it's easier for fixing and easier stripping. Always check and double check your sizes. A lot of small mistakes in building can be fixed up easily, but if you make a mistake in the footings, and don't pick it up straight away, it could be disastrous. I did a job a few years ago, an underground bunker type thing for a seismograph station. It was similar to the lift well photo on my wall formwork page but 12ft deep and the floor slab was a lot larger. I set the base slab formwork up with a plumb bob hanging off my string lines from my ground level profiles. It was perfect, until the building inspector came around the day before we were going to pour concrete. All formed up with about 3 ton of reo steel in there. He climbed down the hole with a tape measure and proceeded to do what I should have done days before. He checked the diagonals for square. "You're miles out Bill !" Oh no................ "how much" I said fearing the worst. "Three quarters of an inch." he said. I gathered My breath and tried to keep my cool, but I had to let him have it. "THREE QUARTERS OF AN INCH IS THREE EIGHTHS OUT OF SQUARE IN 25 FIVE FEET. WE'RE 40 MILES IN THE SCRUB, HALFWAY UP A BLOODY MOUNTAIN, IT'S ALL GOING TO BE BURIED IN A COUPLE OF WEEKS, AND YOU'RE WORRIED ABOUT THREE EIGHTS!" I don't often loose my cool, and this was inexcusable. I was embarrassed by the fact that I had failed to do the simple check of the diagonals that he did straight away. So as I said, double check to save embarrassment of worse later.